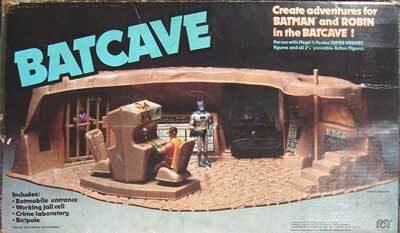 Boxed Mego Batcave from looks very similiar to the Star Trek Enterprise playset produced that same year, quality plastic had given way to cheap vacuform. Careful inspection will show Lex Luthor and not the rightful Joker in the detention cell. This is the original Toy Fair Sales Reel for the Mego Pocket Heroes Bat Cave (which made it into production) and the Spider-Man Alley (which didn’t see the light of day). 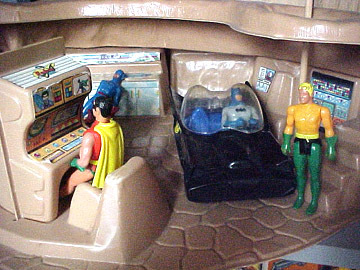 An interior shot reveals an unexpected visit from Pocket Aquaman while Robin is busy at his work station.